We visited Chicago City Hall yesterday as part of our immersion with American institutions. 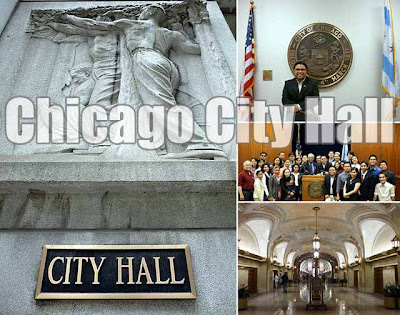 We got to meet Filipino-Americans holding important positions in the City Government of Chicago and got to tour City Hall as well. Mayor Richard Daley wasn't there but it was not a problem since we were meeting him in the evening anyway. Lunch was at the James Thompson Center next door where we experienced more of America's food culture at the fast food center! 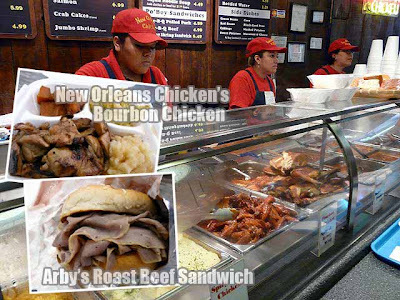 For lunch, I had Bourbon chicken from New Orleans Chicken and a roast beef sandwich from Arby's. With the size of the servings, it's no wonder why we all put on weight when visiting the U.S.
After our afternoon and evening activities, and since the sun was still out at 8 p.m., we visited Millennium Park. Completed in 2004, the park was Chicago's answer to open space since it was built on top of an area previously occupied by the Illinois Central rail yards and parking lots. This makes it the world's largest roof top garden at 9.9 hectares! It has several major artistic elements. 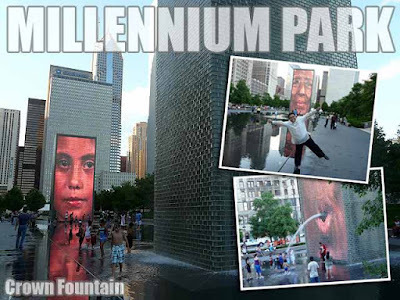 One of these is the Crown Fountain, an interactive public fountain composed of a black granite reflecting pool in between two glass brick towers with high-tech LED video screens behind each block. It's a very creative concept really. The towers project the faces of Chicagoans reflecting the cultural diversity of the city. But what is catchy about the fountain is that water spouts from the towers from the lips of the projected faces making it look like the faces are spitting out water, playing on the historical theme of gargoyles with water coming out of their mouths in fountains. Then there's the large "bean" called the Cloud Gate. Made of stainless steel, it was inspired by liquid mercury and is one of the most popular sculptures in the United States. Finally, there's the Jay Pritzker Pavilion, a band shell designed by controversial but award-winning architect Frank Gehry. It's a popular venue for outdoor concerts. And Chicago knows how to raise funds since most of the features of the park are from corporate donations! That's something Metro Manila should try emulating. I'm sick and tired of the ugly, tasteless and kitsch infrastructure the MMDA has been churning out lately. 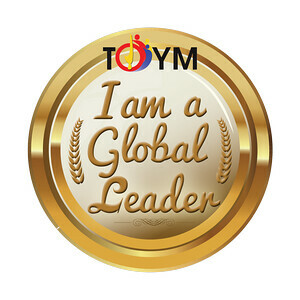 Aren't you? 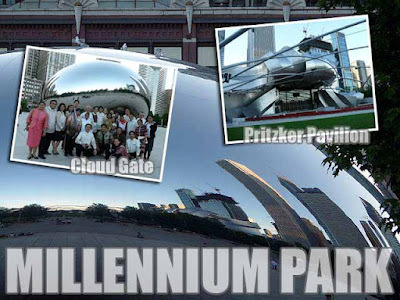 Did you like the giant jelly bean in Millenium Park? yey! the giant jelly bean! !